We all admit it; summer is the top season for grilling. And we like to grill almost anything. Meat, fish, veggies, you name it! 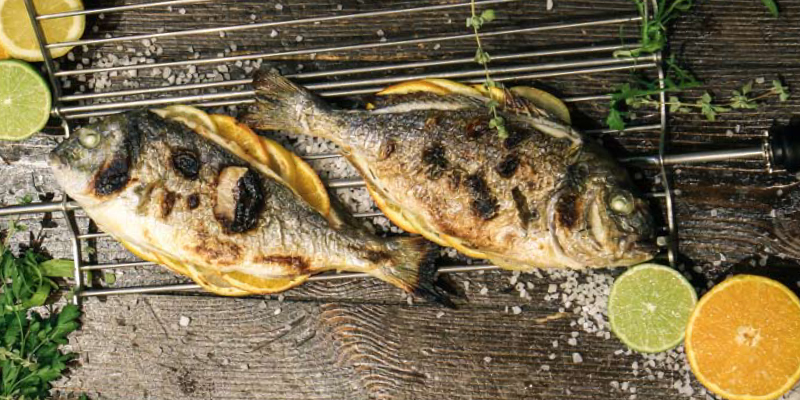 So how does a lovely charcoal whole fish on the grill sound? Topped with a yummy vinaigrette it is the absolute delicacy, for a perfect barbecue meal. So let’s get started! Since we would like our fish to be fresh, we would urge you to buy the fish of your choice on the same day you will grill it. You can select amongst various fishes, but we optimally suggest you to choose between a lovely fresh sea bass, swordfish which is one more great option, black bass, or sea bream (tsipoura) which is very popular in Cyprus. No special preparation is needed to prepare the fish for the grill. Just make sure you take out from the refrigerator approximately 30 minutes before grilling. Rinse well and pat dry with paper towels. You can fill the cavity with fresh herbs and slices of lemon, limes or oranges. This not only adds to the flavor but also enhances the beautification of the dish. Coat the fish with olive oil and add salt and freshly ground pepper. Your next step is to prepare your myGRILL. You will not need a lot of charcoal. It’s easier if you use the myGRILL charcoal chimney starter. Select the “Fish” recipe from the SMART menu and all you will need to do is sit back and relax and allow myGRILL to do its job. While you wait for the fish to cook you can prepare the vinaigrette, or you can have it ready from before. An easy recipe for good vinaigrette is: In a small bowl, whisk together the mustard, garlic, vinegar, 1 teaspoon salt, and 1/2 teaspoon pepper. While whisking, slowly add the olive oil until the vinaigrette is emulsified. When the fish is ready, place it in white plates and pour lemon and vinaigrette over it and serve it immediately. The color of the grilled fish along with the lemon, herb vinaigrette will pop against the white color of the platter, making it a fantastic served dish.